To create a simple EJB module, we will use NetBeans, "New project" wizard. In the example given below, We will create an EJB module project named Component. 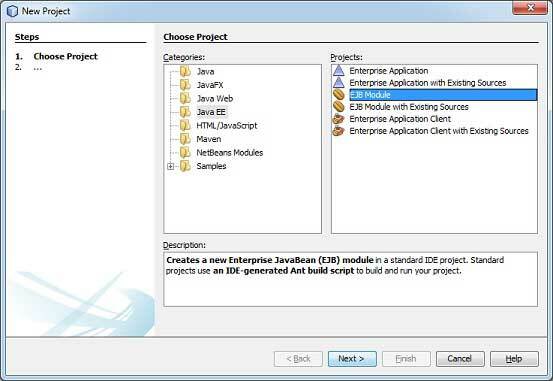 Select project type under category Java EE, Project type as EJB Module. Click Next > button. You will see the following screen. Enter project name and location. Click Next > button. You will see the following screen. Select Server as JBoss Application Server. Click Finish button. You will see the following project created by NetBeans. 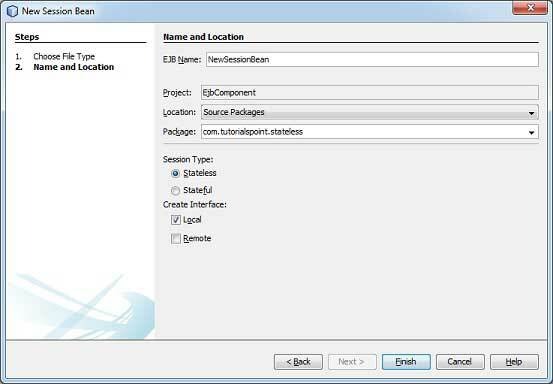 To create a simple EJB, we will use NetBeans "New" wizard. In the example given below, We will create a stateless EJB class named librarySessionBean under EjbComponent project. Select project EjbComponent in project explorer window and right click on it. Select, New > Session Bean. You will see the New Session Bean wizard. Enter session bean name and package name. Click Finish button. You will see the following EJB classes created by NetBeans. I am changing local interface to remote interface as we are going to access our EJB in a console based application. Remote/Local interface is used to expose business methods that an EJB has to implement. LibrarySessionBeanLocal is renamed to LibrarySessionBeanRemote and LibrarySessionBean implements LibrarySessionBeanRemote interface. Select EjbComponent project in Project Explorer window. Right click on it to open context menu. You will see the following output in NetBeans console output. \LibraryPersistentBean.java uses unchecked or unsafe operations. 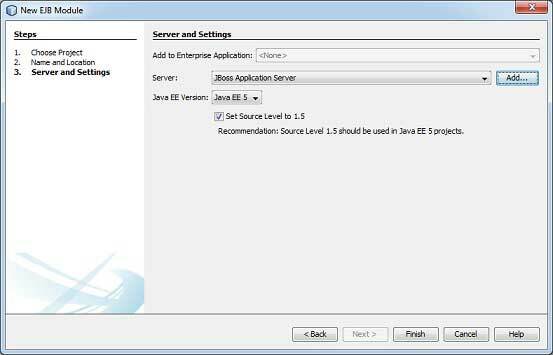 Select JBoss application server under Servers in Services window. You will see the following output in NetBeans, output under JBoss Application Server. In NetBeans IDE, select File > New Project >. Enter project name and location. Click Finish > button. We have chosen name as EjbTester. Right click on project name in Project explorer window. Select properties. 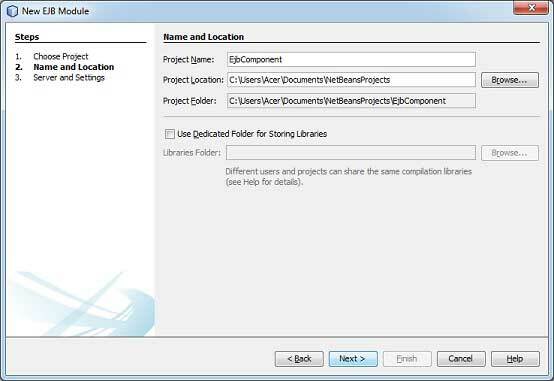 Add EJB component project created earlier under libraries using Add Project button in compile tab. Add jboss libraries using Add jar/folder button in compile tab. 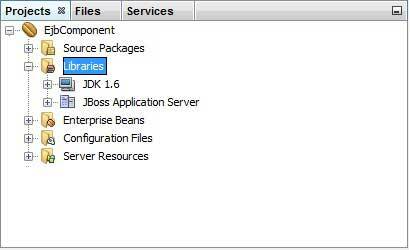 Jboss libraries can be located at <jboss installation folder>> client folder. Create jndi.properties under project say EjbTester. Create package com.tutorialspoint.test and EJBTester.java class under it. In the following chapters, we will cover multiple aspects of this complete EJB application.